Rise & Shine Interview: Kevin Breel | Arianna Merritt, M.Ed. “I suffer from depression” are not the four words that you would have expected to come out of a teenager's mouth on a global stage. Yet, some are breaking the stigma and talking about mental health issues by expressing themselves. The teenager who spoke up on the TEDXKids@Ambleside stage in May 2013 is Kevin Breel. Kevin is a teenager, a stand-up comic, a writer, and an activist for mental health from Victoria, British Columbia. We both have ties to this beautiful city. 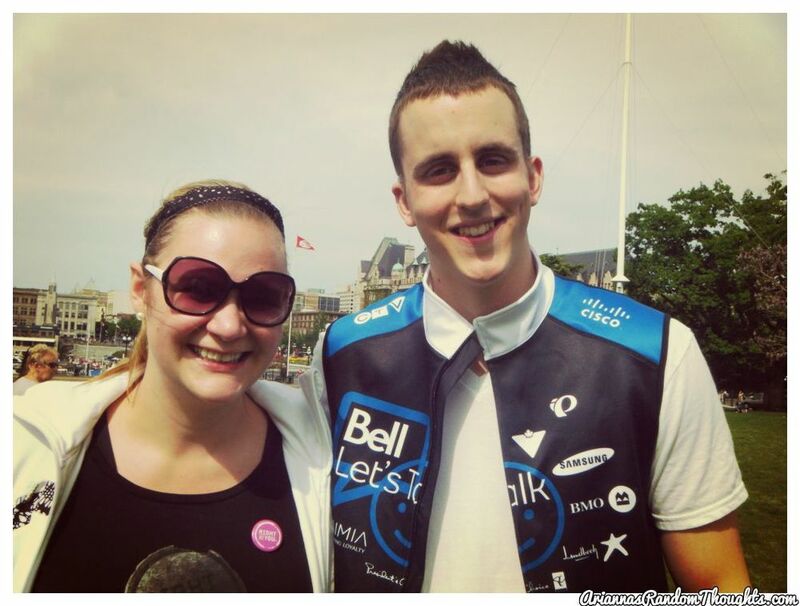 Meeting Kevin Breel at Clara's Big Ride in Victoria, May 15th, 2014. I had to go up and say thank you in person. I was in tears halfway through Kevin’s talk to think such an awesome human being would think of taking his own life. The tears were flowing as many other beautiful souls have left the earth far too soon because they were suffering from the same issue. Many people I know have experienced struggles with depression, and I did too when I was a teenager. The most powerful way I learned to accept this myself was to outwardly express (to others and through writing) that I needed help. As Kevin says in his talk, “It’s in building a world that teaches the acceptance of ourselves.” I thought that by joining forces with Kevin, we could educate others through starting a conversation. I invited Kevin to be part of my “Speaking from the Heart” interview series, as he is a writer. Instead of answering the questions in writing, Kevin and I chatted over the phone. He is a fantastic human being. Kevin’s passion to show others that they matter is infectious; you can hear this enthusiasm in his voice. Our conversation was empowering. After watching Kevin’s TedTalk below, read his answers to my questions on the importance of self-expression. Expression is the exact opposite of depression; it is the reversal. Instead of keeping our feelings and energy inside (i.e., depression), you release them. Life is truly about expressing your thoughts. Sharing your struggles is powerful; it is a big part of growing. People see me as a stand-up comedian and a speaker, but at the core of that, I’m a writer. I create my own material and spread it around. The talks start by writing down my thoughts. Writing has empowered me, as the process has defined and taught me how I think. By expressing your thoughts through writing, you can learn a lot about yourself and how you see the world. Each of us has a voice. Instead of looking at this question as finding/discovering your voice, see it as tapping into your thoughts and releasing your inner voice. We need to stop looking outside ourselves and to start looking within. Many times we see what others have written, and we want to emulate their voice; rather, we need to start being in touch with our own selves and valuing the uniqueness of our own stories. There is purity in that. When I knew I was going to do the TED Talk, finding what I wanted to communicate took almost 3 months. I had to narrow down my usual 1 hour talk into 10 minutes. View the process as shaping a big block of playdough until you have the core message. I went about the process initially thinking, “How do I write a Ted Talk?” Once I began being authentic and gained the courage to share my personal story, I was able to create the talk. For me, I didn’t need to develop courage or bravery to share my story. Those words make it seem that I fear my story and myself. I am not afraid of my thoughts and talking about depression. I look at sharing my story as giving myself the permission to be real. It is important to be honest with yourself. That is where the power lies; expressing what you are truly experiencing gives others hope. This happens every day. As I said earlier, you shouldn’t be looking at this question as finding the perfect words; tap into your authentic voice and let the story flow naturally. When you aren’t being authentic and you judge your thoughts and ideas, that is when writing blocks happen. You need to find that inner place where you give yourself the power to write and for the thoughts to be released without judging. Meditation is the way that really helps me. I can meditate for hours or until the words start flowing. This question implies we have to go looking for one. There is already support waiting for you. You just have to reach out and ask for help. For me, my external support group is my mom, my family, and my friends. The word ‘support’ has a deeper meaning beyond just the people around us. We need to go inward and explore for support resources. To me, this includes: meditation, walking, reading, and being still. These are all acts of self-care. Instead of closing yourself off to the people and resources around you, open up and reach out. Since giving the TED Talk, I have had the amazing opportunity of becoming connected to so many professionals. Through sharing my story and talking to others, I am bridging the gap between the mental health professionals/support resources and those individuals seeking help. I am letting people know that these mental health resources are available. Write from a pure place; a place of authenticity. Don’t write to get results; write your story. For example, the founder of To Write Love On Her Arms (TWLOHA), Jamie Tworkowski, started by writing a short story (read the story here) – then the non-profit organization grew from there. For those who don’t know, “To Write Love on Her Arms is a non-profit movement dedicated to presenting hope and finding help for people struggling with depression, addiction, self-injury, and suicide. TWLOHA exists to encourage, inform, inspire, and also to invest directly into treatment and recovery.” Jamie didn’t write his story for results and profits; he expressed his thoughts to help his friend. People connected to his story. I use this advice when I write my material. All we have is our stories. Thanks for speaking from your heart and empowering others, Kevin!You can see this authenticity in Kevin’s talk, as he is sharing the life that only he sees – his intense struggle with depression. Kevin stands up on global stages and expresses his inner thoughts. He also stands tall at 6'6. One question that came to my mind after reflecting on what Kevin said was “What helps you find that inner place where the words start flowing?” Many people struggle with this, so I’m reaching out to you all and asking for your input. Looking forward to hearing your suggestions!